The Internet of Things (IoT) revolution has sparked an increased interest in home automation. Lighting is one of the major home automation aspects. LIFX is one of the popular crowdfunded companies in this space to have come out with a successful product. The success of their multi-colored LED bulbs brought venture capital funding, allowing them to introduce a new product in their lineup - the White 800. The launch of the White 800 also coincided with firmware v2.00 for the LIFX bulbs. The initial products from LIFX were multi-color LED bulbs similar to the Philips Hue. The new LIFX White 800 is a white LED bulb with tunable color temperature. Color temperature is an important aspect in the lighting environment. In addition to visual comfort, it also affects human behavioral aspects. Different color temperatures are desirable for different human activities. Therefore, tunable color temperature in a single light bulb is a good thing to have. The specifications of the White 800 indicate 890 lumens of brightness (60W-equivalent), 25000 hours lifetime (22.8 years @ 3 hrs/day), 11 W power consumption and tunable color temperature from 2700K to 6500K. The first generation LIFX bulbs relied on Broadcom's WICED platform. It also had a TI chip for 802.15.4 mesh networking. However, the White 800 gets rid of the mesh networking aspect and uses the QCA 4002 low-power Wi-Fi platform. This enables a lower price point for the White 800 compared to the other bulbs in the LIFX lineup. At the heart of the unit is the lighting control module (LCM). LIFX also seems to be targeting this board towards OEMs in addition to using it within the White 800. THe LCM documentation gives more insight into the internal components of the board. 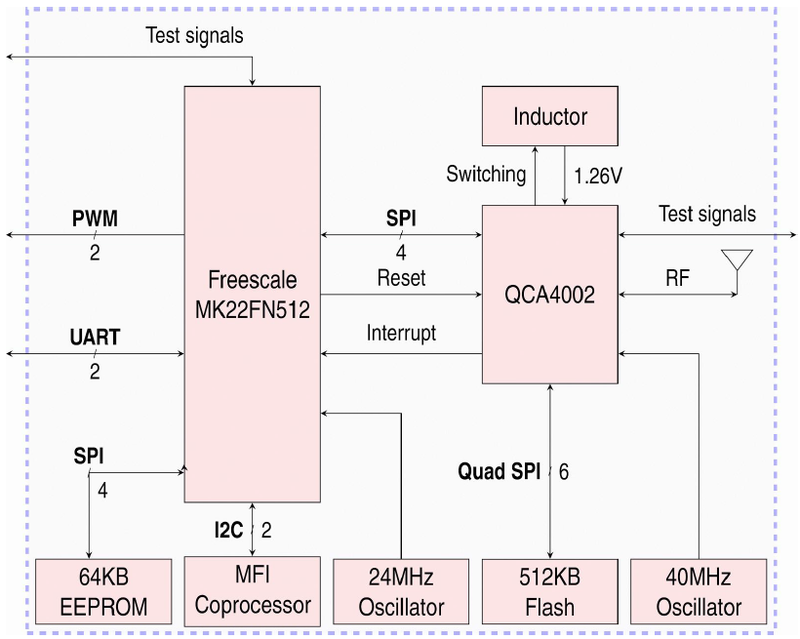 The unit uses a Freescale Kinetis micrcontroller (ARM Cortex-M4-based) coupled with the Qualcomm Atheros QCA 4002. The QCA 4002 is very similar to the AR9330 used in the Ubiquiti mFi devices. The integrated CPU is MIPS-based. It is tuned for low power operation and, correspondingly, lower host CPU performance. The AR933x can run full Linux, but the QCA 400x is targeted towards embedded platforms. In the LIFX, the configuration (QCA 4002) is a 1x1 802.11n 2.4 GHz connectivity platform with the RF switches integrated. 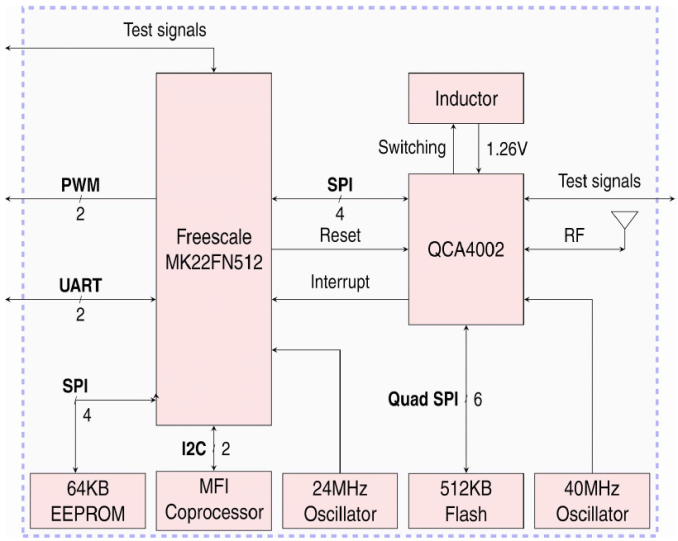 The use of the QCA 4002 software stack on the Kinetis microcontroller allows for AllSeen / AllJoyn certification (the IoT standard backed by Qualcomm). The LIFX White 800 also carries the 'works with nest' logo, thanks to the cloud back-end. We have looked at the internal hardware in the LIFX White 800. In the next section, we look at what the average consumer sees - the setup and usage process. Actually, it sounds like we need a new electrical standard. Kinda like the converse of PoE where you send power along cabling initially intended for network signals. 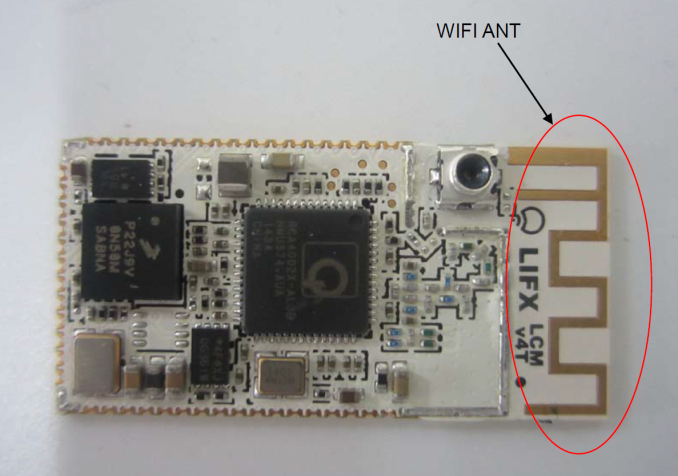 I could see something as simple as the ESP8266 WiFi module as something that you could use instead of what they have. Load it up with the customized LUA firmware on the net and you have a pretty decent cheap small Microcontroller that can run LUA scripts with rx/tx WiFi comm, 2 GPIO's (some revisions) for 3.3 volt operation and around 23kb flash to mess with. Low power and cheap at 5 bucks a piece! Slapping an Cortex-M4 on there is ridiculous I agree. House automation systems should have a comm base that does all the decision making. The bulbs just need to communicate and turn on/off/dim.
" I'd rather have a "smart home" than a "dumb home with smart light bulbs"."